Keep track of the cash you have to spend on comics with this bi-fold wallet. 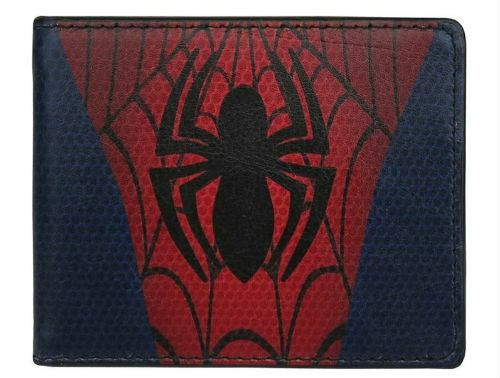 Made of faux leather, this awesome wallet has a web pattern throughout and a cool drawing of the web-crawler’s logo front and center. If the fan in your life wants to show-off their fandom loudly and proudly, this cap is the way to go. This Homecoming-themed hat features the superhero’s symbol in black stitched into the front. The cap can even be adjusted to fit any head shape. Want to display your love for the web-crawler? With this poster, you can! This eye-catching piece features a bright and bold image of your favorite superhero in action. Guests won’t be able to take their eyes of it! Add this super-cool Spider-Man figure to your Funko Pop collection or start a whole new line-up of Marvel heroes! This little man wears headphones and depicts the coolest Spider-Man of the spider-verse thus far! That’s right! You can start warming up your toast with a superb Spider-Man logo imprinted on the bread! What’s more is, this kitchen item is decorated with a cool print of the Marvel hero, too! This makes a great gift for any fan of the character as well as those who like the odd slice of bread. Listen to your favorite music whilst showing off your support for the most adventurous of heroes in the Marvel Universe. These comfortable earphones even come with a built-in microphone, ideal for the gamers in your life! Can’t get enough of Spidey? Show your love with this awesome t-shirt, which features a brilliant graphic of his infamous costume. Want more options? Check out these highly-rated Marvel t-shirts! This metal keychain, which features the hero’s costumed head is shiny and gleaming enough to turn heads. Measuring nearly 3 inches tall, just hook this keychain to your car keys and home keys and go. Peter Parker may prefer an old-fashioned camera to take photos, but anyone will love their smartphone all the more with this case for iPhone 7 & 8. With your friendly neighborhood Spider-Man hanging from the Apple logo, this case would make another great gift that’s awesome and way cool. Your fellow web-slinger friend will never miss another breaking news story again when they have this silicon watch. Its red face with a black spider will almost make them feel like shooting webs out of their hands when they check the time. Even if the recipient of this gift isn’t afraid of the dark, this Light FX Hand nightlight would still look awesome in any room. With its unique design, this light makes a wall look like it’s busted open and Spidey’s illuminated hand is popping right out. This figure makes the perfect gift! 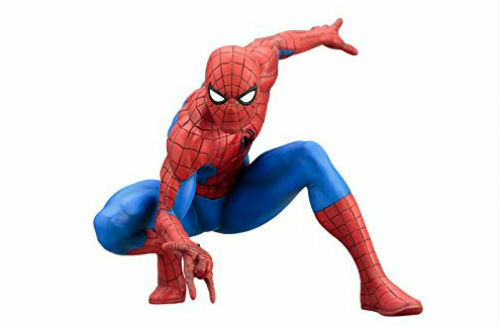 Place this on a shelf and let Spidey watch over you. Start your Marvel figure collection by making this Kotobukiya the first of many! The perfect accessory for your web-head’s home! This bright pillow features the famous silhouette of your friendly local Spider-Man and promises to add some Marvel-ous decor to your room. Even if they don’t have the body of a superhero, the web-slinger in your life can pretend and up their cooking game at the same time with his handy apron. This apron is one of the best Spiderman gifts for adults as well as for barbecue season! Do you know a web-head who works a 9-5 in an office? Gift them with this tie. Guaranteed to vamp up any person’s suit-and-tie outfit, this item makes the perfect and most stylish present! Scanning the internet for Spiderman stuff? Decorate your wall with this poster featuring a cool image of your favorite web-crawler. It promises to add some color and coolness to any room. Men aren’t the only fans of this Marvel hero. For the special lady in your life, get her this handbag which features Spidey’s face imprinted across its soft material. Carry this around – it might just get a girl confused for Mary Jane. If you’re going to lounge around the house, look awesome doing it in this snuggy. You too can dress like a web-crawler in this plush polyester garment, which also doubles as a comfy blanket. You may never want to wear anything else ever again. It doesn’t get cooler or more stylish than this! Hang this necklace around your neck and show-off your support for Marvel’s best superhero! What better person to protect your cookies than Spider-Man? Store your favourite goodies in this fantastic jar and ensure that no one takes a bite! This cookie jar will look awesome on any kitchen counter! Add a little bling to your web-slingers with this super-cool ring! Who knew being a Peter Parker fan could be so fashionable? Make sure your web-slingers are comfortable and well-gripped onto the wheel with this steering wheel cover! Your car journeys have never been more exciting! Nab these for the fashionista in your life. 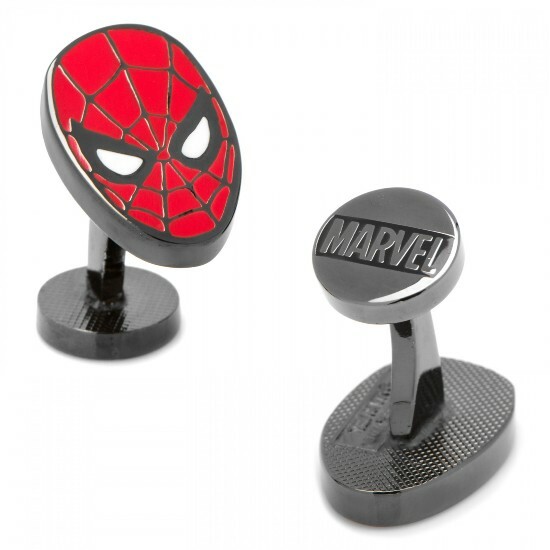 Bearing Spidey’s distinctive symbol, these are a great but subtle way to tell the world you’re a fan of the web-crawler! Your shoe-wear doesn’t have to look boring anymore! Decorate your feet and compliment your PJs with these super-cool slippers! Totally recommended for those who want to show-off their Spidey support loud and proud! This makes a perfect gift idea for Spiderman fans! Was Homecoming your favorite movie from the web-head’s franchise? Pin this poster on your wall and let your guests know just how much of a fan you are! If you’re looking to treat a fan with a good old traditional t-shirt, consider purchasing this one that features a superb graphic of the latest superhero movie. Know someone who would totally wear an ugly sweater this Christmas? Why not treat them to a Spiderman themed one? Not only will this piece of clothing keep you warm but it will also make you the most fashionable one in the crowd! Please any web-slinger friend in your life with these awesome items, or even treat yourself. Even though you can’t be Peter Parker, with all this cool Spiderman merchandise, you’re pretty much as close as you can get. 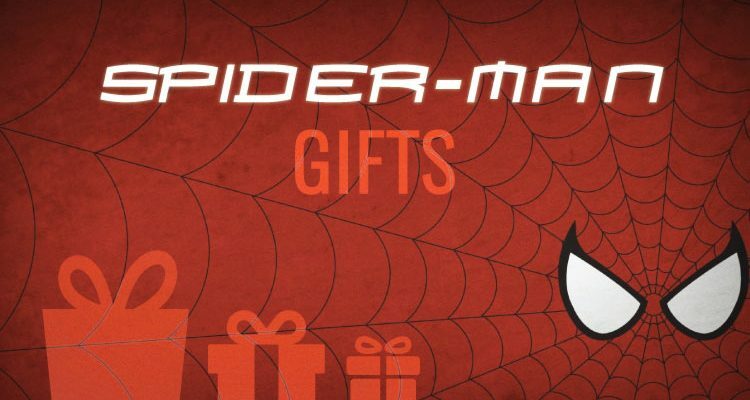 These gifts are great for all Spidey collectors! Need more gift ideas for that superhero devotee? We’ve also got a list of cool Marvel gift ideas that are ideal for all die-hard fans! Nicole M. is a New Jersey-based freelance writer. Although she crafts articles about a variety of topics, her specialities are small business, food, and music. She's written reviews of albums, singles, and concerts for music websites in the past, was interviewed on Fuse in 2013 for a short special on grunge, and has interviewed musicians like Perry Farrell of Jane's Addiction and Ed Kowalcyzk of Live.